All orders outside of the United States, Please call 866-686-9285. Also, We can not ship to a PO Box. It must be a physical address. 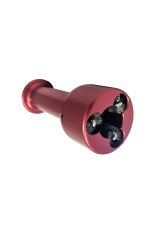 Features: Cleans Wheel Stud Holes Before Pin or Sleeve Installation Use With Electric Drill Stainless Steel Brush Head Replacement Brush for the X-2569-ESB-4 Discounts: Buy 3 or more and get 10% off each one Warranty: 1 year from date of purchase to be free of defects in materials or workmanship. .. 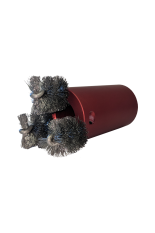 Features: 20/22mm Wheel Stud Cleaner No reverse rotation of drill required Independent brushes can be rotated for maximum brush life Heavy duty stainless steel brushes External hex drive system Discounts: Buy 3 or more and get 10% off each one Warranty: 1 year from date of purchase to be free of defects in materials or workmanship. .. 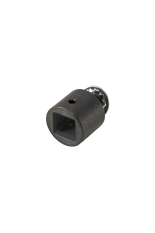 Features: 1/2" Socket Adapter (Does not include Heavy Duty Stud Brush) Discounts: Buy 3 or more and get 10% off each one Warranty: 1 year from date of purchase to be free of defects in materials or workmanship. .. 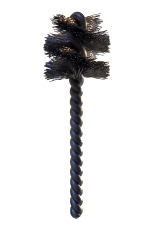 Features: Patent #: D782,757 S 20/22mm Wheel Stud Cleaner Light weight and balanced for easy, fast stud cleaning Enclosed design provides greater durability, strength and safety Use on steer, drive and trailer wheel stud Heavy duty .010 wire diameter stainless steel brush Independent brushes can be rotated for maximum brush life 1/2" drive for use with an electric or air tool Internal brush system Replaceable brushes Part # X-2757-WB Patent Pending Discounts: Buy 3 or more and get 10% off each one Warranty: 1 year from date of purchase to be free of defects in materials or workmanship. .. 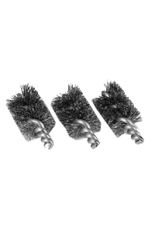 Features: Replacement Brushs for the X-2756-SB - Heavy Duty Stud Brush Set of 3 Stainless Steel Brushes Discounts: Buy 3 or more and get 10% off each one Warranty: 1 year from date of purchase to be free of defects in materials or workmanship. .. 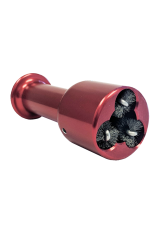 Features: Patent #: D782,757 S 5/8, 9/16, 14mm Wheel Stud Cleaner Light weight and balanced for easy, fast stud cleaning Enclosed design provides greater durability, strength and safety Use on steer, drive and trailer wheel stud Heavy duty .010 wire diameter stainless steel brush Independent brushes can be rotated for maximum brush life 3/8" drive for use with an electric or air tool Internal brush system Replaceable brushes Part # X-2757-WB Patent Pending Discounts: Buy 3 or more and get 10% off each one Warranty: 1 year from date of purchase to be free of defects in materials or workmanship. 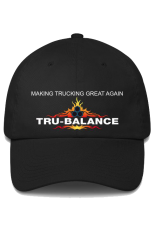 ..
TRU-BALANCE products are "Made In The USA"